Hannah Herbst, a 15-year-old high school student from Boca Raton, Florida, became inspired while writing to her 9-year-old pen pal in Ethiopia. Her pen pal talked about life without many modern amenities we take for granted. “I couldn’t imagine a day without electricity,” Hannah told Business Insider. So she went to work developing a machine that would produce renewable energy for people without. After much tireless work, Hannah designed a probe that generates both power and fresh water by harvesting ocean currents for this year’s Discovery Education 3M Young Scientists Challenge. Here’s the kicker: it’s not some ultra expensive, super fancy device. It costs $12 and is made from recycled materials. The device is made of a 3D-printed propeller connected by a pulley inside a plastic PVC pipe to a hydroelectric generator which then converts the mechanical movement of ocean currents into electricity. Hannah demonstrated the device by powering a set of LED lights from currents in the Atlantic Ocean. Scaled up, she thinks the design could create enough electricity to charge three car batteries at once in less than an hour. That could power saltwater desalination pumps, providing a source of fresh water. It could also power blood centrifuges for medical use or coastal beacons for navigation. 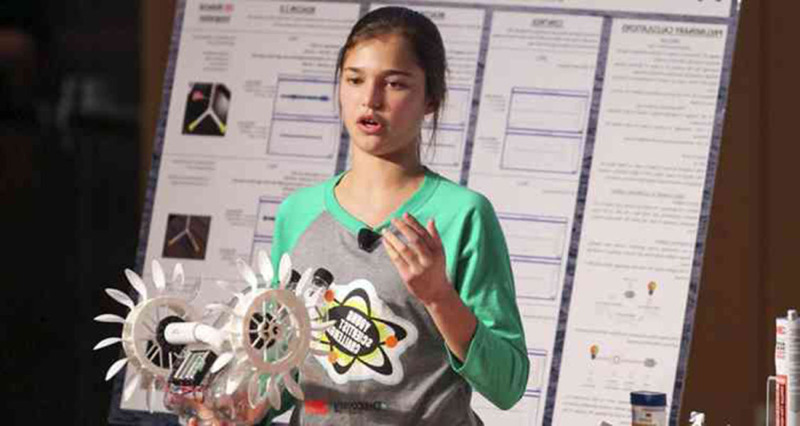 Hannah won the title of America’s Top Young Scientist and $25,000 at the competition.